Bring your kids to enjoy our indoor and outdoor playground and splash pool, which will keep them entertained for hours. Our entrance fee is for unlimited play. We do have a coffee shop on the premises. We are on the venue Gnu Valley Farm, where you can braai at shaded areas and fish at our dams. The children is allowed to bring their own bikes and cycle around our dams. Our options are affordable so that every child can have a party at Gnu Kids. 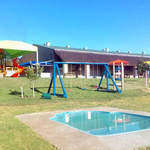 3 hrs play, 3L Oros drink for kids, hotdog per child, themed party box per child, themed plate & cup, hire of steel table with table cloth, hire of kid's tables & chairs, hire of plastic table cover for kids' table, hire of 'Happy Birthday' sign on table, serviettes use of indoor* & outdoor playground. 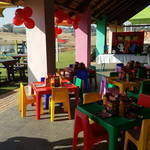 3 hrs play, 4L Oros drink for kids, hotdog per child, themed party box per child, themed plate & cup, table centerpiece, themed 1-tier design cake, balloon on a stick per child, 1 kids sweeties platter (10 kids), hire of steel table with table cloth, hire of kid's tables & chairs & white chair covers, hire of plastic kids table cover, serviettes & use of indoor* & outdoor playground. Contact us today for a quote or you can click here to download our booking form.